May 3rd, 2013: Coaches Across Continents works in complex, challenging, and constantly changing environments which demand a significant degree of knowledge, analysis, judgment, and flexibility in order to meet the context-specific requirements of every unique situation. Accordingly, CAC has to adapt our work in significantly varying situations. To do so, we monitor and evaluate our programs, which allows us to better understand our partners and to work together to ensure that, year after year, the training and guidance received are the most fitted to the local context and community. 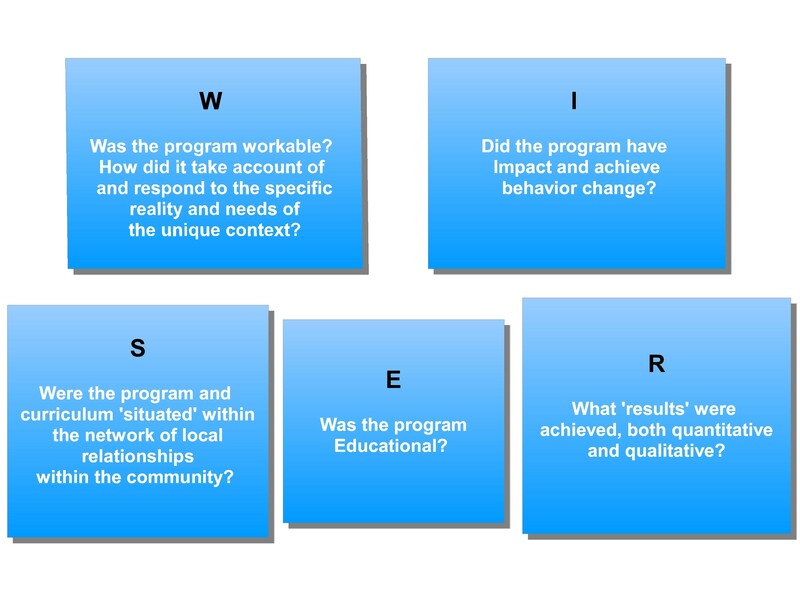 CAC’ specialized monitoring and evaluation system allows us to keep track of the unique issues, challenges, strengths and successes not only in our community partners but also within our own coaching team and methodology. Monitoring and evaluation begins with ongoing communication with partner leaders, even before the on-field training starts. 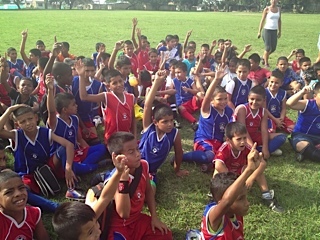 During our training we keep records of local coaches’ attendance, hours on the field, number of children reached as well as the games taught to local coaches. 1. 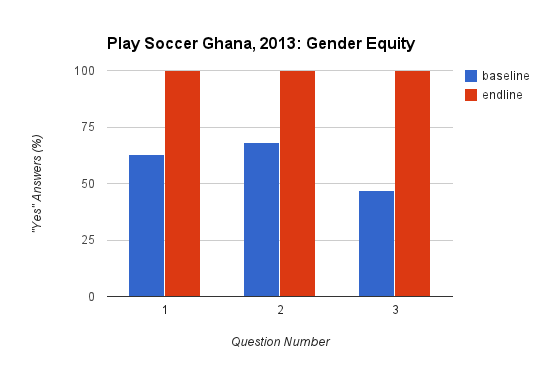 Do you know how to use football to teach young people about the role and place of women and girls on the soccer field, at home and in the community? 2. 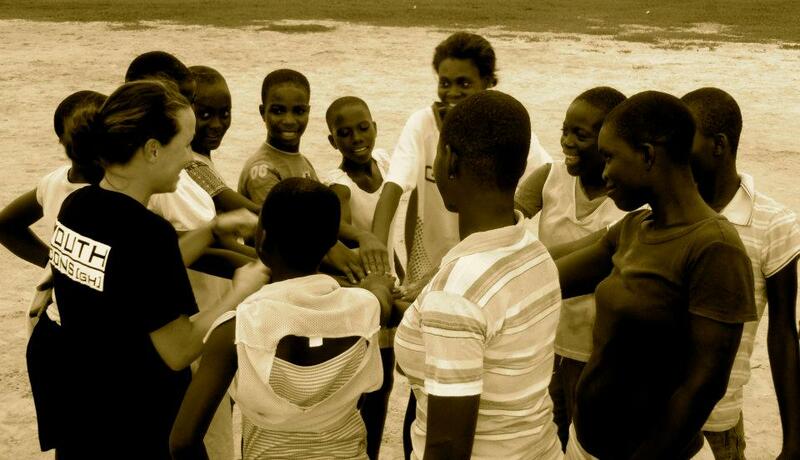 Do you know how to use football to give girls confidence to “have a voice” and make personal choices through football? 3. Do you know how to teach girls about powerful female role models? With all this information, CAC then compiles a qualitative overview of the program with suggestions for further years. We also record the unique impacts that result each year from the training delivered by the CAC team: our impact models try to capture how CAC’s tools and resources create impact within the community. The model takes into account the inputs, outputs, and outcomes from each year of the partnership and gives room for unique circumstances, or unexpected results. 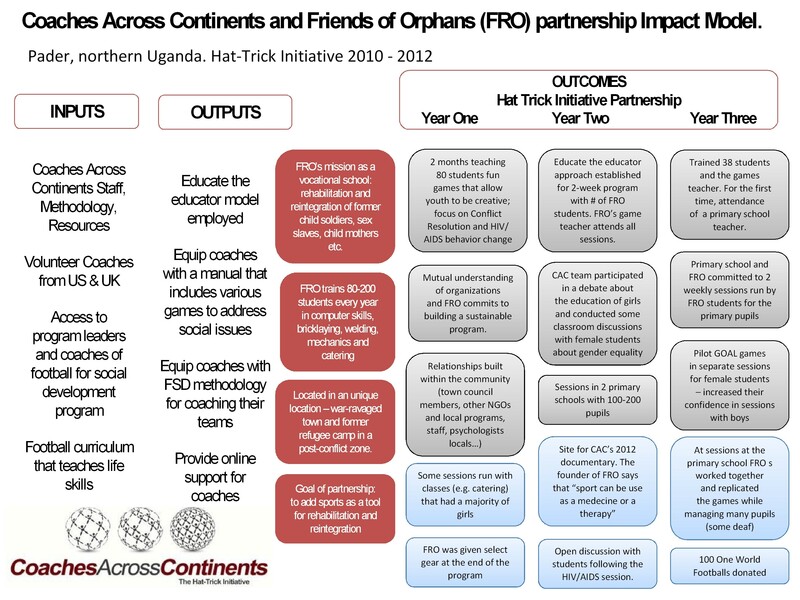 Impact model for our partnership with Friends of Orphans in Uganda. In the end a global picture emerges that allows us to understand our role as a partner to many organizations and to reasses our approach with each partner program moving forward. Watch our video to learn more about our unique Monitoring and Evaluation system ! to make evaluation and monitoring is the better way to asses our selves .